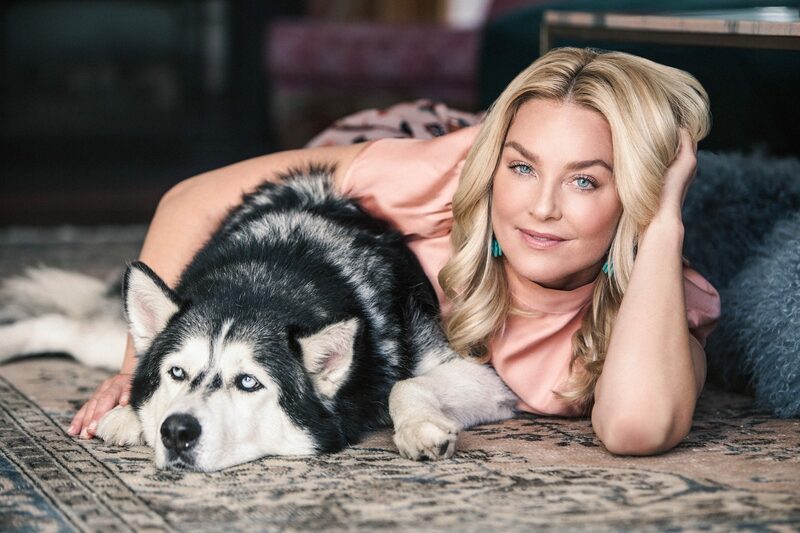 Elisabeth Rohm is perhaps best known for her roles on the much-loved TV shows ‘Law & Order’, the cult classic, ‘Angel’ and most recently crime drama, ‘The Oath’ where she stars alongside Sean Bean, as well as Oscar-nominated films 'Joy' and 'American Hustle'. We caught up with Elisabeth to find out what led her from achieving academic honours in history, to acting and where her passion from dogs comes from. Hi Elisabeth! Thanks so much for your time today. You have one dog, don’t you? He looks gorgeous. Please tell us all about him. My dog's name is Blue, and he is a Husky-Malamute mix. We rescued him from the Mission Hills NKLA shelter. At the time I was working on a TV show called ‘Stalker’ on CBS, and we will be forever grateful to Maggie Q who introduced us to NKLA and helped us find our beautiful wolf dog that Easton [Elisabeth’s daughter] had set her heart upon. We had spent time with my brother Lucas who had a friend with two Husky/Wolf type mixes and it became Easton‘s mission in life to have one of her own. It seemed a little bit eccentric to have that type of dog in California, but as we began to explore the shelters, we found out very quickly that there had been one Husky that was owner surrendered and in pretty bad shape. At first I paused and thought, “Should I tell Easton that I got this call?" and of course moments later I was just as eager to see him as she was. We went up to Mission Hills and saw Blue (who had originally been named Spike), and it was love at first sight. He was pretty emaciated and his ears had Fly Strike and were bloody, crusty, and rapidly disintegrating, not to mention he had scratches from dog fights on his body and face. But he was the sweetest dog and wouldn’t stop licking us. His eyes were shining so bright and we immediately fell in love with him. We left the shelter without him because I wanted to teach Easton that adopting a dog is a huge responsibility and we should not do anything impulsive. Later that evening, I asked her if she had been thinking about him and she said “yes of course”. I asked because I had been thinking about him nonstop! The next day we went and picked him up on that hot summer day five and a half years ago and it was one of the most joyful days of our life! Where does your love of dogs come about? My love of dogs comes from my mother who had a white Boxer when I was born named Jenny. She’d had her since she was 18 and she was the love of my mother’s life until I came into the world. Jenny would babysit me by my crib and never left my side as a little girl. As I was getting a little bit older, Jenny was the softest pillow in the house and I would always lay my head on her stomach when I was reading a book on the floor or playing with my toys. She was like the dog in Peter Pan, Nana. I learned from my mother that a love of animals softens the heart and brightens every day. It becomes a sort of meditation as you develop a true and sweet friendship with your dog. My mother grew up with Boxers, and so the tradition continued. Throughout my childhood we had three different Boxers — Jenny, Pepsi, and Romeo. It goes without saying Romeo was my absolute favourite. As an actor, you must travel quite a lot. Last year you were filming for TV shows ‘The Oath’ and ‘Magnum P.I.’ as well as a new film ‘Fair and Balanced’, which is due out this year. How do you balance work with your home life? The nice thing about my career is that there is a very balanced breakdown of family life and work life. I tend to be home about five months of the year where I’m a full-time mom. And when I’m working of course we travel. Thankfully ‘The Oath’ shoots in the summer and Easton comes with me when I’m in Puerto Rico. ‘Fair and Balanced’ filmed in LA and ‘Magnum PI’ was a very short gig. It all works out, and frankly is a lot easier on our family than if I had a 9-to-5 office job. I feel very blessed and grateful to be an actor. What do you love most about acting? Is it the freedom to be creative, to plan time and projects around your family or using your profile to talk about the things that are important to you (and others)? Or a combination of everything? I would say all of those aspects that you just described are what I love about acting. Firstly, I’ve always needed an outlet to express my emotions. At 14 I already knew that I was going to be an artist of some kind. I love the freelance life. I love travelling. I love the team that it takes to make a movie, the family that builds when you’re on a long run of a television show and the cinema scope of being on location making a project. It’s very intense and saturated, like being in a waking dream as Christian Bale said about working with David O Russell. You mention you always knew you wanted to be an artist of some kind. What drew you to acting specifically? Oddly, I came to acting far later, about midway through college at Sarah Lawrence. I was a history major and very compelled by the Merchant Ivory movies to explore a world that I had read about. I loved how film transported me to places that I could only read about in books. A couple of other movies like ‘Cinema Paradiso’ and ‘Out of Africa’ also inspired me. Period pieces from faraway lands awakened my imagination. I was also very interested in writing at Sarah Lawrence and the human experience whether through the pen or through performance. It's what has always compelled me to dig deeper in my artistry. I am fascinated by human beings how we long, how we love, how we create homes and habitats and habits, how we build families, how we betray those we love and how we long to be forgiven. Redemption, redemption, redemption and of course, love. Human beings are complex and yet very simple. Ultimately they long for the same things. I guess the compassion and understanding of human experiences is what compels me to be an actor. We are complex individuals, aren’t we? Getting back to dogs a little, all in the name of fun and based on personalities alone, which breeds of dog come to mind when you think of these actors? Jennifer Garner - Irish Setter. Dwayne ‘The Rock’ Johnson – Bulldog. Charlize Theron - Golden Retriever. And what about you, what breed of dog would you be? I think your photos show a great synergy, all in the eyes, between you and Blue. Here are a few quick-fire questions about life and Blue, are you ready? Film – ‘BlacKkKlansman’ by Spike Lee. Book – ‘The House of Names’ by Colm Toibin. Where is Blue’s favourite place to be? Blue’s favourite place to be is in his bed by the front door guarding the house. He is our great protector and he takes his job seriously! Finish the following sentence: my dog is… a spirit animal. He’s an empath. He’s a totem animal. Something most people don’t know about me is that I’m all about my family and being the matriarch. I love to cook, feed and nurture like an Italian grandmother. What one life lesson do you think we can (or should) learn from dogs? The one thing I think we can all learn from our animals is how to slow down and just be. I love the Eckardt Tolle cartoon book about being with our dogs. I think if we could take life in, slow down and just be present in it we would find a lot more happiness and maybe even the light in every little thing. Delight in it more. Certainly we would be much more connected to each other if we weren’t constantly on the treadmill of life. And finally, if Blue could speak and you could ask him one question and one question only, what would you ask him and what do you think he’d say? If I could ask Blue one question, I would ask him “How am I doing so far?”. Blue is my number one witness to life as a single mom with my beautiful daughter Easton, working, friends, family and also our rescue cat Amber. I’d be curious what his observations were of my juggling act and where I could improve. I think he’d say I’m killing it and handling it all with grace like all other super moms that get so much done in a single day.